Michael Neno is a cartoonist, letterer, and comic book creator. He sent me a copy of the most recent issue of his self-published comic book, The Signifiers. It was a blast to read, and I wish more people were turned on to this unique and exciting comic book. The Signifiers #2 continues the story of “Splash” (whose last name might be Henderson). He is a young black man, with a Summer of Love vibe, who must either obey or fight a mysterious force called The Voyst. Early in issue #2, Splash is having breakfast with The Signifiers, when one of them, Maria, gives him a box of breakfast cereal. At her behest, Splash reaches in and removes a strange device, the Ypytlic. What is it? Can anyone tell him? A visit to Tiffany and to his Aunt Sharon might yield answers. Meanwhile, in Hippyland, Landlark the Heat-Seeking Dwarf joins a group of free spirits to tap into the Voyst, with trippy results. Also, meet Fearful and Joyful, two members of the four freaks known as the Emotionists. THE LOWDOWN: When I reviewed The Signifiers #1, I wrote that one of the first things that captured my imagination about comic books was that the pictures they held within their flimsy covers were strange and full of weird-looking things. Comic books were fun to read and decipher, and the unique graphics and iconography kept me reading comic books even when I didn’t completely understand what they were trying to tell me. Obviously, I still love comics, even when I am having trouble figuring out the contents. I still don’t understand the world of The Signifiers, but I am less clueless after reading #2 than I was after reading #1. Obviously, The Signifiers is graphically and spiritually similar to Jack Kirby’s Fourth World comic books for DC Comics. There is also a passing resemblance to some early Marvel Comics titles, including those drawn by Kirby and Steve Ditko. However, in spite of influences, The Signifiers is stubbornly different. It is as if Neno has put a solid, brick wall between his influences and inspirations and the work he produces. You might recognize the source, but you better recognize Neno’s distinctive creation. The result is a really cool comic book and comic book package that offers more than most comic books. The Signifiers gives the reader more than the standard 20 to 22-page cover feature; there is also a short story or two. While I am enjoying The Signifiers, at the same time I am trying to unravel it, I can also enjoy Landlark, the rough-looking dwarf with a nose for cool adventure. The Signifiers #2 introduces The Emotionists, and I promise that the three-page introduction is not enough. The Signifiers #2 also includes an interview that Michael Neno conducted with fellow comics self-publisher, Tom Scioli, whom readers might know from the Kirby-esque series, Godland (written by Joe Casey). What Scioli has to say will likely prove invaluable other for self-published comics creators. 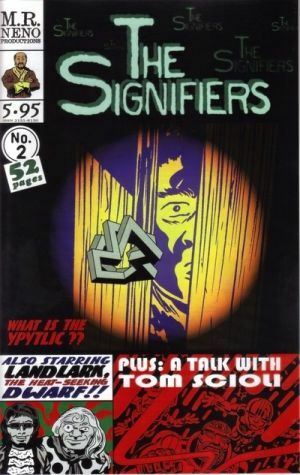 Believe me when I say that The Signifiers #2 is a steal at $5.95. Three excellent comics serials, plus an interview with some crucial and valuable information: could I ask for more? Yes, I want The Signifiers #3. POSSIBLE AUDIENCE: Readers looking for old-timey that is a fresh and good-timey will want The Signifiers.